NEW YORK (AP) — In the first major soiree of Hollywood’s awards season, Chloe Zhao’s elegiac, lyrical Western “The Rider” took best feature film at the 28th annual Gotham Awards. But the night’s final honor went to “The Rider,” the second feature by the Chinese-born Zhao, despite no previous awards on the night and only one other nomination: an audience award nod alongside 14 other films. Some may have forgotten it was eligible. Having first premiered at the Cannes Film Festival in May 2017, “The Rider” was nominated by the Gotham’s West Coast corollary, the Independent Film Spirit Awards, in February as one of last year’s best. Zhao, too, wasn’t in attendance (she is prepping her next film). And few looked more surprised than the producers — Bert Hamelinck and Mollye Asher — who accepted the award. “This is going to be the worst acceptance speech,” stuttered Hamelinck. As an Oscar bellwether, the Gothams, presented by the not-for-profit Independent Film Project , are of little value. Their nominees are chosen by small juries of filmmakers and film critics before some of the fall’s films have been seen. “First Reformed” star Ethan Hawke took best actor and its 72-year-old writer-director Schrader (“Taxi Driver,” ”Raging Bull”) won best screenplay. Burnham’s “Eighth Grade,” starring 15-year-old Elsie Fisher, won for both breakthrough director and breakthrough actor. Tributes were also paid to “At Eternity’s Gate” star Willem Dafoe, “22 July” director Paul Greengrass and RadicalMedia founder Jon Kamen. But one of the night’s abiding themes was who wasn’t there. Toni Collette, star of the horror film “Hereditary,” wasn’t on hand to collect her best actress award. 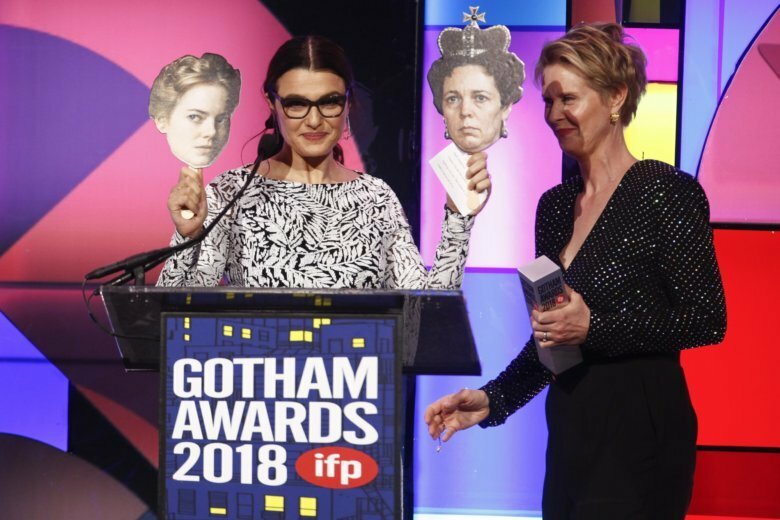 And Weisz was the only star of “The Favourite” there for the film’s ensemble award. Weisz held up cardboard paddles of Colman and Stone’s faces and read statements from each claiming that they were the real standout in Lanthimos’ triangular tale of a power struggle in Queen Anne’s 18th century court.